Drop is a very hard novel to rate. On the positive side, it’s a pretty decent, slow-paced, slice-of-life Otome Game story which takes the time to really develop its characters. At no point are you reading about cardboard cut-outs but about sometimes surprisingly multi-facetted characters that fully live in their world. Relationships of different kinds are also developed, Cordelia’s family, the people at their mansion and later her friends are gradually introduced and usually given time to breathe. 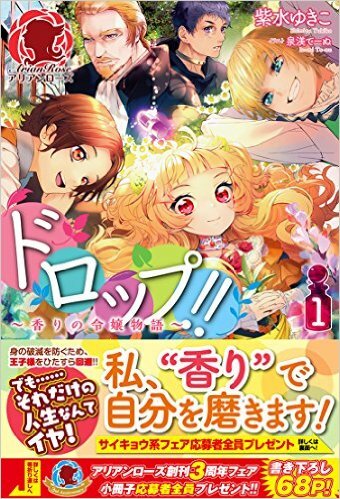 The romance is slow but very sweet and develops in a way... more>> which seems believable for the children that the main characters are. It’s not the most gripping or exciting story ever. Most of the time, crises are small-scale and easily resolved, and in all honesty, not much happens. Which is fine. Although there are a few storylines that make use of slightly darker elements, they have so far always been played out quite lightly. I guess I would describe it as a very gentle story. Although most of the story is told from Cordelia’s point of view, the chapters are written in the third person and have actual paragraphs, which is a welcome relief after the many webnovels that use and sometimes abuse first person narrative and single line writing. Chapters not from Cordelia’s perspective are in first person, which occasionally makes for a nice change of pace. If that were all there was to it, I would recommend this WN whole-heartedly to anyone looking for something sweet and mellow. Unfortunately, there is more to it. There is all the time spent on herbs. Or flowers. And their various uses. It seems churlish to complain in a way. For one thing, the author clearly stated – twice in fact – in the actual title that the story would revolve around a girl who likes perfume. Readers were warned. For another thing, this story takes the complete opposite direction of most of these reincarnated-into-a-game (or whatever) world where the characters can use their apparently endless and arcane knowledge to create pretty much whatever happens to be useful that day. Ever rolled your eyes over the fact that the MC can reproduce sophisticated items in an environment where manufacturing is practically stuck in the Bronze Age? Ever had to suspend disbelief when they find the one vital ingredient or component for their “invention” which only happens to grow in one place (usually their back yard) but is there in abundance despite the fact that no one had ever figured out a use for it? Ever been annoyed at how they go from raw materials to fully completed end product in a matter of days, with the only concession to realism being that they had to “experiment” for a while before attaining success? Well, don’t worry, Drop does not do that. With Drop, you are left in no doubt whatsoever that Cordelia was knowledgeable about herbs in her past life, that she puts in a lot of study over them in this life, and that she researches intensively and, some might say, obsessively, into how best to use them. As perfume. Or as essential oils. Or as scented soap. With details about the respective manufacture of all these products and more. Maybe for those who are into these things, reading this is fun. But for me, it was about as exciting as reading the list of ingredients on a bottle of shampoo. A case of too much of a good thing perhaps? Be careful what you wish for? At any rate, there are just too many explanations about the things Cordelia researches and produces. I found myself looking forward to chapters from others characters’ points of views simply to escape from the endless herbs, and flowers, oils, scented candles and so on and on. The translators deserve medals for translating some of the drier parts of this story. No one's translating atm and aside from the first chapter there's no readable translation, but I'll give a short review since I've been enjoying it a decent amount. I've read up to c77 out of the current 103 WN chapters (a decent stopping point as it's a time skip), a few chapters of the manga, and one volume of the LN. Very minor spoilers ahead, so take heed if you want a completely blind read. The story is about Cordelia, the daughter of a Count in a medieval era Europe style... more>> setting with magic. In her former life she was a rather sheltered girl who went to an all girl's school, straight into college, and then led a life as a scientific researcher. In her former life, she had knowledge of an otome game and realizes she had reincarnated as the villainess of said game. Striving to avoid the death that awaited her if she followed the events of the story, she does her best to avoid those events while turning her interests to developing various things based on her past knowledge. What I like about her backstory is that it makes perfect sense that she knows what she does, unlike other stories where you wonder whether you should've studied harder back in high school if random kids apparently have that much knowledge. She was a scientist in her past life, and none of the knowledge she showcases can be considered to be very complicated. I wouldn't buy it if she started busting out various chemical formulas in IUPAC format since unless it's your current project there's no way you'd remember anything like that beyond the simplest and most common ones, but given the most advanced thing she does is distillation it's more than believable. She never really steps out of her specialty either and relies on others for those, such as when she needs flasks and she goes to a glass specialist instead of magically having the relevant knowledge and skill. Cordelia herself is also a decent character. She's always thinking of others and tends to seek to mediate or fix things when given the chance. But she's also a fair hand in an actual fight, capable of using magic to manipulate plants (growing plants, manipulating vines, withering plants, etc.). While not the most capable of fighters by far (her bodyguard Ronnie can beat her handily without trying, let alone her brothers or her father), she's able to outfight your average adult (she was able to largely subdue a decently confident Count 1v1 before Ronnie came in and ended the fight). Side characters such as her servants Ronnie and Lala or family Ishma, Cyrus, or her father are also fun and have their own distinct personalities. I especially like her father as he absolutely dotes on her despite having a very strict countenance and a fearsome reputation to the point people look at Cordelia funny when she says he's nice. The author does have a tendency to introduce characters and then sort of just leave them to the side for the rest of the story aside from a couple of mentions here and there (Aisha, Hazel, etc. ), but they're at least mentioned and it does prevent the story from character bloating which is a problem some other stories have. The "heroine" of the otome game, Sherry, is also present, and she's rather annoying. She's very definitely written to be annoying, always running around being self-centered and a bit egotistic. She's not unkind and thinks of others as befitting a heroine, but it seems that due to Cordelia's actions affecting slight changes throughout the world and the effects of her heroine abilities, Sherry has grown up rather differently than her game counterpart. I won't reveal more as that veers into heavy spoiler territory, but it seems likely Sherry will end up being more an antagonist than not. She's nonetheless someone I rather like as a character, even if she herself is rather unlikeable. All that said, the WN has some very glaring flaws. It's chalk full of grammatical and spelling errors to the point that some sections are painful to read. I very much doubt the author does any sort of editing as some errors are extremely blatant and have been pointed out multiple times. The LN fixes these errors, so if at all possible read that instead. The story also seems very unplanned at times and feels like it just meanders about for a few chapters before it starts in another direction entirely. This is sort of obvious with the chapter titles, such as the "Founding Festival Season" chapters that end up having absolutely nothing to do with the Founding Festival as they take place after and have everything to do with solving an instance of fraud and the reveal of the possible main villain. There's also a manga, but I'm not a big fan of it. It's not bad, but I feel like it's missing the point of several story beats and isn't doing a great job of portraying characters correctly. YMMV. If I had to give the story a grade, I'd say it's a solid B+. It has its problems and feels pretty amateurish at times, but when it's good it's good. The LN is definitely better than the WN and does a lot to clean things up (to the point I wonder whether it's one of those stories some Japanese editors have been complaining about where the editor ends up rewriting most of the story, but who knows) so I'd recommend reading that over the LN, but it's not like the WN is unreadable. Just know there's a lot of mistakes in the WN, which will make MTL's a lot more painful than it already is if you need to rely on one to read. This is still early but... it's one of those story where the MC reincarnates as a villainess who would've eventually fallen in ruin, so MC decides to use her knowledge and pursue a different path, in this case, herbology. You know these kind of stories tend to be interesting and the MCs are usually smart and/or capable enough to think their way out. They're willing to use their head and are hardworking for the sake of their future. This particular MC actually has a good head. She's clever and capable, uses... more>> her knowledge properly. She also has cuteness which she uses heh. At first I was thinking WTF is this ****** prologue. The opening of the story was kind of lame but as the story progresses, the first person dialogue of Cordelia starts getting a little interesting. It's a dark story but I started hoping for a good outcome for the girl. I've read the current raws, which is up to the part of the game plot where the villainess should have died and and heroine is supposed to get her happy end with the prince. Good: There are actual reasons in the story for the game plot to happen and why it derails, in both the villainess/heroine character and background scheming. The characters are interesting and have depth, plus the world has a bit of depth. Questionable: The main girl's focus on herbs and perfume amounts to a rich girl's hobby boutique of... more>> questionable value should she actually take any damage to her reputation. She doesn't develop much personal strength, instead focusing on making connections and relying upon others. Whether this is good or bad will probably vary by personal taste. Bad: The heroine makes little actual progress towards any of her goals. Avoiding romance with the prince? Avoiding dying in a fight with the heroine? Developing herself so she can defend herself? At the end of the story she's basically a damsel in distress making it through with luck and plot armor events. The ending is feeling really forced at the moment, although it's still being written so it might be salvaged. To explain it with minimal spoilers, when the prince was finally going to be honest with Cordelia, they were interrupted by a forced plot event that set up him rescuing her from the stupid plot event seemingly so the prince to skip explaining himself and working things out. It kinda feels like the author gave up on the developed plot to force a "happy" ending. That could change, but it doesn't feel like it. Originally I thought this was junk, but it turns out the writing style changes after the first few chapters. It starts out as a monologue which didn't let me immerse myself properly in the story. Think of it as if the prologue extended into the early chapters. Following this, it turns similar to other otome game novels. The main character reincarnates as the villainess with a future bad ending which must be avoided. She decides to avoid develop perfumes and oils to polish her beauty. As is common in novels like this, she goes about town disguised as a commoner and uses magic. Possible future love interests who are characters in the otome game are introduced. I like this a lot; the childhood arc is quite cute so far. The cute parts kind of come at you by surprise. The chapters are all serious about science, noble etiquette, household politics, etc. And then all of a sudden something super adorable happens. These smaller moments make the novel for me. I absolutely love this story. I love the type of stories where the MC start making their own products and area bit dense in the romantic area, and this is exactly what this story has to offer. The MC's relationship with her doting father is also very endearing. The story is a bit slow paced and doesn't really have any romantic scenes at the moment, but we're only at chapter 10, so I'm expecting there to be a lot more things happening in future chapters. Fairly typical as these go, though of course the emphasis is always a bit different. In this one, that emphasis is on the main character's relationship with her family, especially her father and her absent mother, as she tries to build something closer with them, and on botany / herbology magic. Mix in childhood friendships with other characters from the original otome game (including, of course, the prince, though she doesn't realize that), and tech-development in the form of some basic... more>> chemistry / alchemy and you end with nothing groundbreaking. I was expecting some mindless teeth rotting fluff but ended up being pleasantly surprised. There's no obligatory school arc since Cordelia spends her time researching herbs and developing new products while striving to be the perfect Noble lady. Oh, I also removed the Harem and Reverse Harem tags that's been a misleading eyesore so rejoice my fellow harem haters. The cast of characters doesn't exist to simply fawn over Cordelia. A prime example being her family. Her father is more along the lines of the Prime Minister from Duke's Daughter and... more>> the scheming cold-hearted King from Tensei Oujo; strict and wise. He is doting like most fathers but everything he does is laced with expectation for his whimsical daughter's creative mind. Her brothers who are both knights occasionally appear during their offdays while her older sister is consistently mentioned throughout the story. Usually I like crafting and "reincarnated as the villain" stories, but this one just couldn't catch my attention. It felt like the stakes weren't high enough for it to be exciting, while it also didn't have enough joy/whimsy to be a captivating slice-of-life story. Add on the characters' lack of motivation or emotion, and it just felt bland to me. Maybe it really does pick up the pace later on, but for now this mostly just felt like an information dump for people interested in researching herbs. And don't get me... more>> wrong -- I usually like stories where the character is researching, collecting, concocting, etc, but the writing style just lacked enough "spark" to keep my attention. At the point where I felt like I was forcing myself to keep reading, I decided to drop it.